Due to poverty, Tuyen?s parents are unable to afford for basic needs and send her to rehabilitation center to teach her sign language and basic skills. Her family asks for help from local protection center. The case worker refers her case to Holt for support. The child was awarded with $165 for 12 months, to pay for her school fees. Tuyen is physically healthy upon admission. She's with cognitive dump and deaf. She stands 115 cm and weighs 22 kg as of now. 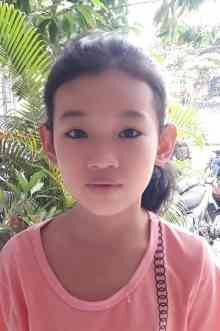 Tuyen was born to a poor family in Nha Trang. She is with cognitive dump and deaf. Her parents are all poor. Her mom works at freelance labor. Her dad is a fisherman with unstable income, about $2 per day. Tell your friends Tuyen needs a sponsor!